For tips creating with the border essential dies see the video here. Instructions: Prepare a white 4 x 6" card base layered with a 3 3/4 x 5 3/4" piece of the Buttons and Blooms paper. Die cut an Intricate Swirl Frame out of white cardstock, place small foam dots on the back and adhere to card. 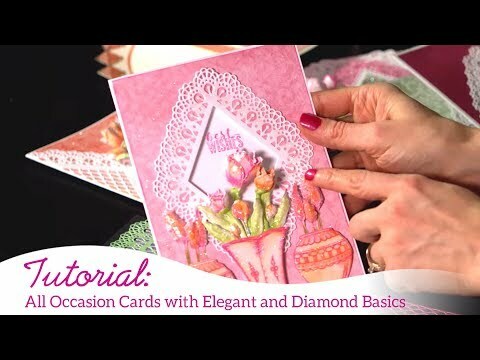 Die cut the Lacy Diamond out of white cardstock, add foam dots to the back and adhere to the center of the card. Next stamp the sentiment on white cardstock with the Paradise Teal ink and cut out with the Eyelet Diamond die, add foam dots to the back and adhere to the center of the card. 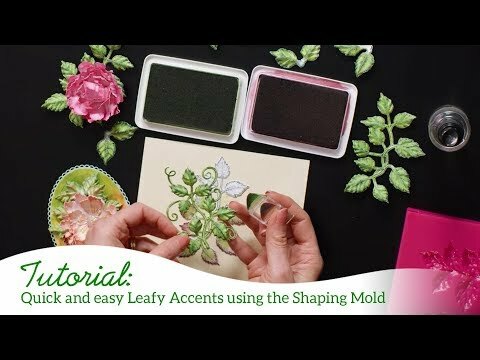 Stamp the leaves on white using the Library Green ink, color with the Leaf Green, cut out using the coordinating die, place in the mold and run through the die cutting machine. Adhere around the card as shown. Locate the preprinted birds from the Cherry Blossoms paper and cut out with the matching die, adhere to card. To finish, add glitter to all the leaves and flowers.